Walnut Tree House is ideal for family get-togethers, celebrations, or as a base to explore the many varied attractions of West Sussex. Short breaks are available all year round. Its features include 3 double bedrooms, 1 twin bedroom & 3 bathrooms with travel cot available, open plan kitchen / dining room, two Inglenook fire places and an attractive garden with gardener. Rustington is ideally situated at the foot of the South Downs, just half a mile from the sea making it a perfect base for exploring the delights of West Sussex. It has all the local amenities you would expect from a much larger village and within 1 mile, has 2 golf courses and a swimming and leisure centre. Shops and restaurants are all within walking distance and it is just 100 yards from the family friendly Lamb public house. Littlehampton is a 5 minute drive where you will find a thriving harbour and yacht marina and Worthing town centre is a 15 minute drive. History: A beautiful and spacious Grade II listed semi-detached house in Old Rustington; Walnut Tree House is a comfortable home sleeping 8-10 with a small secluded garden, only two minutes walk from ‘The Lamb Inn’, three minutes from local shops and 500 yards from the beach. Walnut Tree House is ideal for family get-togethers, celebrations, or as a base to explore the many varied attractions of West Sussex. 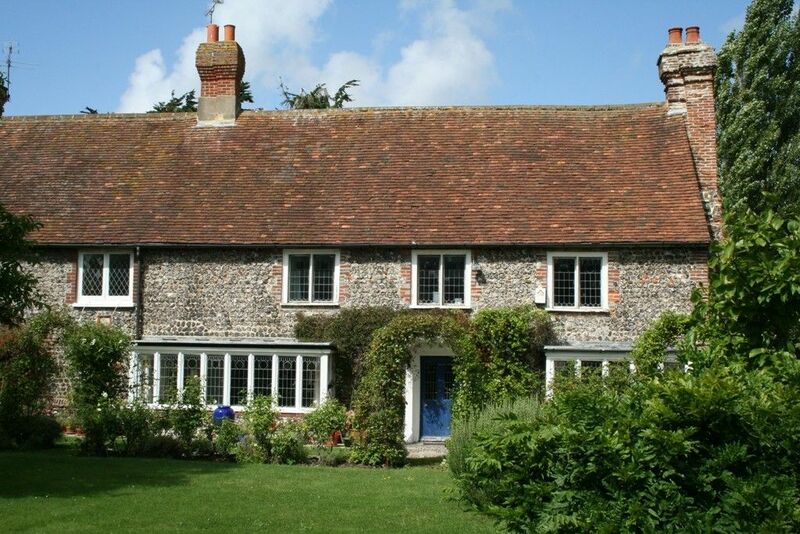 Walnut Tree House is possibly the oldest property in Rustington dating from the 15th Century. Until the fifties it was a working farm but slowly the land was sold. Originally a medieval timber frame hall house. In Georgian times a new front door and portico added. The house was refaced in flint when 2 inglenook fireplaces were added. In late Victorian times the bay windows were added and the leaded light windows. In about 1910 the house was renovated and 2 mill stones from the demolished Rustington Windmill were placed as fire hearths. Accomodation: The accommodation is over 3 floors in the older part of this semi-detached house. Features of the property are low ceilings and beams throughout. It is a double fronted house with the Front Door to the entrance hall leading on the right to the kitchen and the Living Room on the left. A utility room and WC lead off at the rear. The Farmhouse Kitchen has a 6 burner range, granite worktops, dishwasher, fridge & freezer. The Kitchen is open plan to the Dining Room with a large feature inglenook fireplace and a large Riley Mahogany Dining Table with seating for 8. The Living Room at it’s largest 25’ x 12’, again has an Inglenook fireplace around which there is seating for eight on three settees. There is a television with free view channels. The study area off, has a desk and chair with facility for a computer link up. From the Living Room are stairs to the first floor. The Master Bedroom is 25’ long and 10’ wide with a Bath / Shower room en suite. There is a king size bed, fireplace and cupboards for clothes storage. The second bedroom is a large double with dressing Bathroom en suite. Again there is built in clothes storage and a King size bed. The stairs to the 2nd floor lead off the landing and the upper 2 bedrooms (1 double and 1 twin) share a shower room with toilet. Each bedroom has vaulted ceilings with low beams. Care must be taken not to bash your head so are ideal for children. With 2 en-suite bathrooms: one with shower enclosure and bath; one with corner bath. Absolutely loved our weekend at the house. We took our team away for a brainstorming break and the house was near perfect. Lots of space, light and bright and great facilities. The only downside was the lack of wifi for pretty much the entire weekend. I understand from the landlady that this was not normal but I would check it has been sorted before you book if you require it. Kitchen for cooking and some fun pubs down the road. Thanks for having is to stay. Thank you very much for taking the time to write a review. We are delighted to hear you had a lovely stay at Walnut Tree House. It was an absolute pleasure having you all to stay. Great character property with loads of features. Really great rental property, close to Rustington shops and 15mins to the beach. Could just do with a bit of modernisation in the bathrooms but apart from that a great place. We had the most wonderful time. The cottage is just amazing. Just cannot understand or accept previous criticisms. The stain glass windows are a bit damaged. But they are ancient and repairing them with modern glass would be a travesty! Very comfortable beds, cozy feel. Christmas tree, plus decorations, fresh fruit and flowers made us feel welcome and instantly at home. Cannot thank Val enough. We will be back!! Thank you so much for taking the time to write a review, we really appreciate it. We are so pleased to hear you had a great time at Walnut Tree House. It was an absolute pleasure having you all to stay and we would be delighted to have you stay again for another holiday at Walnut Tree. We used Walnut Tree House for a family gathering the weekend before Christmas and it was a perfect place for a family get-together. There were 6 of us and a baby so we had plenty of room. The huge master bedroom was a joy. Everywhere was very clean and beautifully prepared for us, with clean towels being delivered to the door as cross-over with others has been fairly tight! The house itself was, as others had commented, slightly 'tired' in places, although somehow this added to to its charm - the kitchen was well-kitted out although we could have done with a few more spoons (!) and the oven seal was slightly worrying but did not let us down. it was a perishingly cold weekend but the house retained it's heat, even with the slightly draughty windows and the fireplace was a delight. What would have been lovely would have been if the fireplace in the dining room could have been used - curtains on the dining room windows too would have been good as it certainly chilled the room down. Shops were very close by with a superb Waitrose and the sea was just a walk away. We really enjoyed our stay and would certainly return - a lovely old house in a charming village. Well recommended. Rustington is a seaside village within easy reach of the historic town of Arundel where Arundel Castle is exceptional, together with its gardens and boating lake. Rustington has a beach but is close to the new South Downs National Park with walking, cycling and Hacking. Chichester with its beautiful Chichester Cathedral, Chichester Festival Theatre, shops and harbour, are close by. Worthing is 5 miles from Rustington with shopping, Worthing Pier and the annual World Bowls Championships. Littlehampton is our neighbour with the River Arun, Littlehampton Marina and the Thomas Heatherwick inspired east Beach Cafe. Brighton is easy to reach with Brighton Pavilion, Brighton Pier and the famous Brighton Lanes for shopping. Many people visit for Goodwood Racing, Goodwood Festival of Speed and Goodwood Revival meeting which are readily accessible. Fontwell Racecourse is 20 mins away. Parham House and Petworth House are well worth visiting. Near Chichester are the pretty villages of Bosham, Dell Quay, Itchenor together with the well known beaches of the Witterings and Selsey. We are ideally situated for Goodwood Festival of Speed and Goodwood Revival weekends.